I love Chinese orange chicken and I decided to make it since my older son is home from the university for Thanksgiving weekend and he loves Chinese food. I found a recipe online that didn’t look too difficult to make even though it has a lot of ingredients. Although it was very time consuming so only make it when you have a lot of time to spare. I hope everyone had a great Thanksgiving. Combine the ingredients for the marinade. Add chicken and marinate for 15 to 20 minutes. In a small to medium sized pot add chicken broth, a few drops of sesame oil, lemon juice, orange juice, rice vinegar, and soy sauce. Stir in cornstarch and water mixture until sauce thickens, then season with salt to taste. Check sauce for the desired thickness. If it is too runny for you then you can add a bit more corn starch and water. Set sauce aside and keep warm. Take chicken out of marinade, shaking off the excess and toss cubes in the 1 cup cornstarch. Shake off excess cornstarch and place on a plate. Heat up the 3 cups oil in a pot or wok. When oil just begins to smoke, add the first batch of chicken cubes and deep-fry until cooked through, about 4 to 5 minutes. Remove chicken with a slotted spoon and drain on paper towels. Reheat orange sauce and add fried chicken cubes. Place the chicken servings on two plates and sprinkle sesame seeds and green onion on top. Did your son like it? 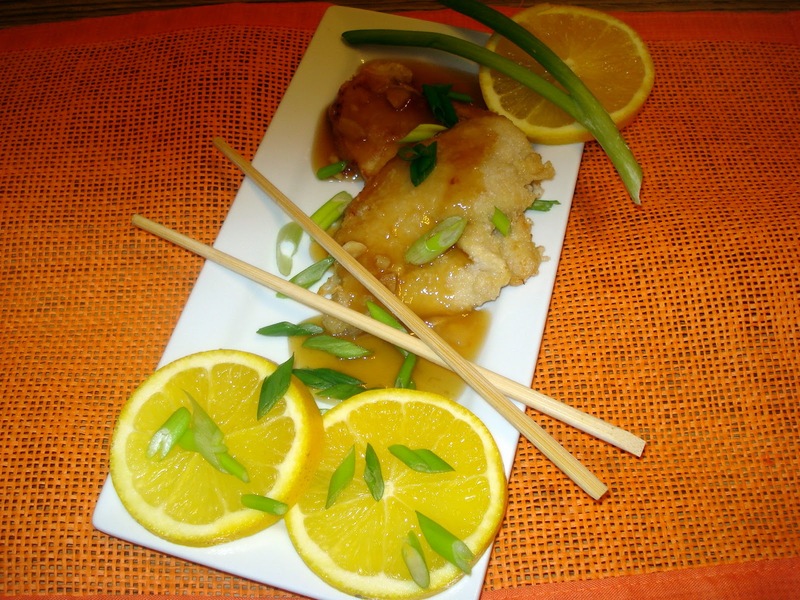 Sure looks good, thanks for sharing your Orange Chicken recipe, look forward to trying. This sounds realy good. I love orange chicken too. E ‘la prima visita al tuo blog e adoro le tue ricette, vi invito a visitare il mio. I stumbled upon your beautiful and colorful blog. If you like, go and see, you’re welcome. I love orange chicken – it looks great. Thank you Joanne…it was really good! 🙂 Have a great day!